Abalone, a stone waterjet cut mosaic, shown in polished Shell, Thassos, and Afyon White, is part of the Auroraô Collection by Sara Baldwin for New Ravenna. Abalone, a waterjet mosaic is shown in Honey Onyx (p), Oceanside Glass #048. Abigail, a waterjet and hand-cut stone and glass mosaic, shown in honed Aquaberyl glass and polished Calacatta, is part of the Parterre Collection by Sara Baldwin for New Ravenna. Abigail, a waterjet stone and glass mosaic, shown in honed Afyon White, Infinity glass and Shell, is part of the Parterre Collection by Sara Baldwin for New Ravenna. Acadia, a hand-chopped stone mosaic, shown in tumbled Giallo Reale and Emperador Dark. Aladdin, waterjet jewel glass mosaic, shown in Tortoise Shell. Alcala, a waterjet stone mosaic, shown in Jerusalem Gold honed, is part of the Miraflores Collection by Paul Schatz for New Ravenna Mosaics. Alcala, a waterjet stone mosaic, shown in Heavenly Cream, polished Carrara, Ming Green, and Thassos, is part of the Miraflores Collection by Paul Schatz for New Ravenna. Alcazar Grande, a waterjet and hand-cut stone mosaic, shown in polished Calacatta, Spring Green, Blue Macauba, Rojo Alicante, and Renaissance Bronze, is part of the Miraflores Collection by Paul Schatz for New Ravenna. Alcazar Grande, a waterjet and hand-cut stone mosaic, shown in polished Calacatta, Spring Green, Blue Macauba, Rojo Alicante and Renaissance Bronze, is part of the Miraflores Collection by Paul Schatz for New Ravenna. Amulet, a hand-chopped stone mosaic, shown in tumbled Blue Bahia, Nero Marquina, Thassos, Chartreuse, Montevideo, Travertine White, Blue Macauba, and Celeste. Anisa, a waterjet jewel glass mosaic, shown in in glass Agate. Anisa, a waterjet stone mosaic, shown in polished Calacatta Tia, is part of the Silk Road Collection by Sara Baldwin for New Ravenna Mosaics. Arabesque, a waterjet stone mosaic, shown in polished Afyon White, honed Montevideo, and polished Socorro Grey. Arubus, a hand-cut stone mosaic, shown in polished Soccoro Grey, Nero Marquina, Carrara, and honed Cavern. Arbus Medium, a hand-cut stone mosaic, shown in polished Calacatta Radiance, Wujan Jade, Nero Marquina, Carrara, and Kay’s Green, is part of the Palazzo collection by New Ravenna. Aspen, a hand-cut stone mosaic, shown in polished Calacatta Tia, Driftwood, Travertine Noce, Persian Gold and Sylvia Gold. Atticus, a waterjet stone mosaic, shown in honed Calacatta, polished Thassos and Shell, is part of the Parterre Collection by Sara Baldwin for New Ravenna. Augustus, a waterjet stone and glass mosaic, shown in Thassos honed, Thassos polished, and Tropical White glass, is part of the Parterre Collection by Sara Baldwin for New Ravenna. Aurelia, a hand-cut mosaic, shown in Lapis Lazuli, Iolite, Mica, Absolute White, and Blue Spinel Sea Glassô is part of the Sea Glassô Collection by Sara Baldwin for New Ravenna. Automne, a waterjet and hand-cut stone and glass mosaic, shown in 24K Gold Glass and tumbled Afyon White, is part of the Auroraô Collection by Sara Baldwin for New Ravenna. Avila, a waterjet and hand-cut stone mosaic, shown in honed Thassos and polished Statuarietto, is part of the Miraflores Collection by Paul Schatz for New Ravenna. Avila, a waterjet and hand-cut stone mosaic, shown in polished Cloud Nine and honed Lavigne, is part of the Miraflores Collection by Paul Schatz for New Ravenna. Baby Venus, a waterjet and hand-cut stone mosaic, shown in honed Dolomite and polished Carrara. Baby Venus, a waterjet and hand-cut stone mosaic, shown in polished Botticino, Thassos, Travertine White. Bamboo, a hand-cut stone mosaic, shown in polished Emperador Dark and honed Verde Luna, is part of the Metamorphosis Collection by Sara Baldwin for New Ravenna Mosaics. Bamboo Quilt, a hand-cut stone mosaic, shown in honed Thassos, and tumbled Chartreuse and Blue Macauba. 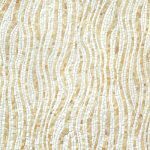 Bamboo, a hand-cut stone mosaic, shown in honed Ivory Cream and Jerusalem Gold is part of the Metamorphosis Collection by Sara Baldwin for New Ravenna Mosaics. Bark Birch, a hand-chopped stone mosaic, shown in tumbled Travertine White. Big Bang, a hand-chopped mosaic, shown in tumbled Thassos, Bardiglio and Rosa Portagallo. Birds and Branches, a hand-cut jewel glass mosaic, shown in glass Obsidian, Quartz, Agate. Block Party, a hand-cut jewel glass mosaic, shown in Agate. Napoleon, a waterjet stone mosaic, shown in polished Calacatta Gold, Thassos, and Gold Glass. Bonnie, a hand-cut jewel glass mosaic, shown in Chrysocolla, Feldspar and Moonstone, is part of the Plaids and Ginghams Collection by New Ravenna Mosaics. Bottles, a waterjet jewel glass mosaic shown in Moonstone, Opal and Tourmaline, is part of the Erin Adams Collection for New Ravenna Mosaics. Brighton Wave, a hand-cut mosaic, shown in Bizazza glass. Brighton Wave, a hand-chopped stone mosaic, shown in tumbled Kay’s Green, Ming Green, and Celeste. Bryce, a hand-cut stone mosaic, shown in honed Afyon White, tumbled Thassos and Shell. Designed by Sara Baldwin Designs for New Ravenna. Cable Knit Large, a waterjet stone mosaic, shown in Venetian honed Dolomite, is part of the Palazzo collection by New Ravenna. Cadiz, a waterjet stone mosaic, shown in polished Ming Green and honed Jura Grey, is part of the Miraflores Collection by Paul Schatz for New Ravenna. Cadiz, a waterjet stone mosaic, shown in polished Ming Green, is part of the Miraflores Collection by Paul Schatz for New Ravenna. Calla, a waterjet stone mosaic, shown in honed Lavigne and polished Cloud Nine, is part of the Miraflores Collection by Paul Schatz for New Ravenna. Calla, a waterjet jewel glass mosaic, shown in Quartz and Aquamarine, is part of the Miraflores Collection by Paul Schatz for New Ravenna Mosaics. Calla, a waterjet stone mosaic, shown in honed Jura Grey, is part of the Miraflores Collection by Paul Schatz for New Ravenna. Castilla, a waterjet and hand-cut jewel glass mosaic, shown in Quartz and Aquamarine, is part of the Miraflores Collection by Paul Schatz for New Ravenna Mosaics. Castilla, a waterjet and hand-cut stone mosaic, shown in honed Jura Grey and polished Calacatta Tia, is part of the Miraflores Collection by Paul Schatz for New Ravenna. Castilla, a waterjet and hand-cut stone mosaic, shown in honed Jura Grey and polished Calacatta Tia is part of the Miraflores Collection by Paul Schatz for New Ravenna. Chatham 2, a waterjet stone, shown in polished Calcatta Tia, is part of the Silk Road Collection by Sara Baldwin for New Ravenna Mosaics. Chatham 3, a waterjet stone mosaic, shown in Driftwood and Calacatta Tia honed. Chinoiserie, a hand-cut glass mosaic, shown in Emerald, Tourmaline, Labradorite, Opal, Tiger’s Eye, Amber, Peridot, Champagne, Rose Quartz, and Pearl jewel glass with Marcasite Sea Glassô is part of the Sea Glassô Collection by Sara Baldwin for New Ravenna. Christopher G1, a waterjet jewel glass mosaic, shown in Amethyst, is part of the Illusionsô Collection by Sara Baldwin for New Ravenna. Christopher G2, a waterjet jewel glass mosaic, shown in Tortoise Shell, is part of the Illusionsô Collection by Sara Baldwin for New Ravenna. Circle Field, a hand-cut and waterjet stone mosaic,shown in honed Calacatta and polished Bardiglio. Circle Field, a hand-cut stone mosaic,shown in polished Travertine White and Botticino. Cityscape, a waterjet jewel glass mosaic shown in Pearl, Lavastone, and Tourmaline, is part of the Erin Adams Collection for New Ravenna Mosaics. Claudette, a hand-cut and waterjet stone mosaic, shown in polished Afyon White and tumbled Thassos, is part of the Parterre Collection by Sara Baldwin for New Ravenna. Claudius, a hand-cut stone mosaic, shown in polished Allure, Xanadu, Nero marquina, and honed Calacatta gold. Climbing Vine, waterjet jewel glass mosaic, shown in Aquamarine and Quartz Jewel glass. Clouds, a hand-cut mosaic shown in Absolute White, Moonstone, Opal, Pearl, Amazonite, Covelite, Quartz, Chalcedony, Champagne, Alabaster, and Aquamarine Sea Glassô, is part of the Sea Glassô Collection by Sara Baldwin for New Ravenna. Cloud, a hand-cut stone mosaic, shown in tumbled Carrara, Thassos, Lettuce Ming, Celeste and Ming Green. 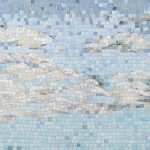 Clouds, a waterjet jewel glass mosaic in Opal, Agate, and Moonstone, is part of the Erin Adams Collection for New Ravenna Mosaics. Coliseum, a waterjet stone mosaic, shown in Calacatta honed and Calacatta venetian honed, by Sara Baldwin for New Ravenna Mosaics. Connecting Circles, a waterjet stone mosaic shown in Calacatta and polished Nero Marquina, is part of the Silk Road Collection by Sara Baldwin for New Ravenna Mosaics. Coral, a hand-cut jewel glass mosaic, shown in Rose Quartz, Sardonyx, and Agate, is part of the Erin Adams Collection for New Ravenna Mosaics. Coral, a hand-cut stone mosaic, shown in Celeste, Thassos and Blue Bahia, is part of the Erin Adams Collection for New Ravenna Mosaics. Cosmique, a hand-cut glass mosaic, shown in 24K Gold Glass, is part of the Auroraô Collection by Sara Baldwin for New Ravenna. Cosmos, a hand-cut stone and glass mosaic, shown in polished Afyon White with 24K Gold Glass, is part of the Auroraô Collection by Sara Baldwin for New Ravenna. Coventry Garden, a hand-cut stone mosaic, shown in polished Calacatta Tia, Verde Luna, and honed Jura Grey, Fontenay Claire, and St Richard. Creatures of the Night, a hand-cut and waterjet stone mosaic, shown in honed Allure and Afyon White, is part of the Kiddo Collection by Cean Irminger for New Ravenna. Curvaceous Crossroads, a hand-cut stone mosaic, shown in polished Ivory Cream, Celeste and Aegean Brown. Cyril, a hand-cut stone mosaic, shown in polished Calacatta Tia and Bardiglio, is part of the Palazzo collection by New Ravenna. Daisies, a waterjet jewel glass mosaic, shown in Moonstone and Labradorite, is part of the Erin Adams Collection for New Ravenna Mosaics. Daisies, a waterjet jewel glass mosaic, shown in Greta, Rolly and Labradorite, is part of the Erin Adams Collection for New Ravenna Mosaics. Danube, a waterjet jewel glass mosaic, shown in glass Moonstone, Quartz, Chalcedony. Danube, a waterjet stone mosaic, shown in Calacatta Tia, Bardiglio and honed Thassos, is part of the Silk Road Collection by Sara Baldwin for New Ravenna Mosaics. Danube, a hand-cut and water jet stone mosaic, shown in polished Calacata Tia, honed Montevideo, and tumbled Celeste. Delaunay, a hand-cut stone mosaic, shown in honed Cirrus and polished Dolomite. Delaunay Grand, a hand-cut stone mosaic, shown in polished Calacatta Tia and honed Thassos, is part of the Palazzo collection by New Ravenna. Demi Lune, a waterjet stone mosaic, shown in water jet cut honed Angora, is part of the Illusionsô Collection by Sara Baldwin for New Ravenna. Demi Lune Petite, a waterjet mosaic, shown in Aquamarine jewel glass, is part of the Illusionsô Collection by Sara Baldwin Designs for New Ravenna. Demi Lune, a waterjet stone mosaic, shown in honed Heavenly Cream and Calacatta, is part of the Illusionsô Collection by Sara Baldwin. Dervish, a waterjet and hand cut stone mosaic shown in polished Calacatta Tia, is part of the Silk Road Collection by Sara Baldwin for New Ravenna Mosaics. Des Cerceaux, a hand-cut stone mosaic, shown in 1.5 cm polished Calacatta and Celeste. Des Cerceaux small, a hand-cut stone mosaic, shown in 1 cm and 1.5 cm polished Celeste and Breccia Oniciata. Djinn, a waterjet stone mosaic, shown in Calacatta Tia polished, is part of the Silk Road Collection by Sara Baldwin for New Ravenna Mosaics. Dune, a hand-chopped stone mosaic, shown in tumbled 1.5cm Emperador Dark and Travertine Noce. Dune, a Sea Glassô mosaic, shown in Absolute White and Agate, is part of the Metamorphosis Collection by Sara Baldwin for New Ravenna Mosaics. Dune, a stone hand-chopped mosaic, shown in tumbled Bianco Antico, Afyon White, and Thassos. Dune, a hand-chopped stone mosaic, shown in tumbled Thassos and Carrara. Eddies, a hand-chopped stone mosaic, shown in 1 cm Blue Bahia, Bardiglio, and Carrara, is part of the Metamorphosis Collection by Sara Baldwin for New Ravenna Mosaics. Eden Rock, a hand-chopped stone mosaic, shown in tumbled Lagos Gold and Crema Marble. Design by James Duncan for New Ravenna. Edie , a waterjet jewel glass mosaic, shown in Obsidian, Lavastone, Tortoise shell and Amazonite. Edie, a waterjet stone mosaic, shown in Nero, Bardiglio, Thassos, and Carrara, is part of the Silk Road Collection by Sara Baldwin for New Ravenna Mosaics. Edie 2, a waterjet stone mosaic, shown in Nero, Bardiglio, Thassos, and Carrara, is part of the Silk Road Collection by Sara Baldwin for New Ravenna Mosaics. Ella, a waterjet and hand-cut stone mosaic, shown in Calacatta Radiance and Celeste. Ella, a waterjet stone mosaic, shown in Gold Glass, Shell, and honed Bardiglio. Ella, a waterjet and hand-cut stone mosaic, shown in Nero Marquina and Afyon White, is by Sara Baldwin for New Ravenna Mosaics. Eros, a waterjet jewel glass mosaic, shown in Quartz jewel glass. Esferas, a waterjet and hand-cut stone mosaic, shown in honed Calacatta, polished Bardiglio and Power Gray glass, is part of the Parterre Collection by Sara Baldwin and Paul Schatz for New Ravenna. Esferitas, a waterjet and hand-cut stone and Serenity glass and mosaic, shown in honed Paperwhite, tumbled Thassos, and Tropical White glass, is part of the Parterre Collection by Sara Baldwin and Paul Schatz for New Ravenna. Estelle, a waterjet stone and Serenity glass mosaic, shown in honed Thassos and Tropical White glass, is part of the Parterre Collection by Sara Baldwin for New Ravenna. Ester, a hand-cut mosaic, shown in Peridot, Aventurine, Garnet, Sardonyx, Rose Quartz, Lapis Lazuli, Blue Spinel, Iolite, Citrine, and Quartz Sea Glassô. Ester, a waterjet and hand-cut stone mosaic, shown in hand-cut honed Thassos and polished Carrara. Ettienne Petite, a waterjet and glass mosaic, shown in polished Calacatta, 24 K Gold Glass, and honed Nero Marquina, is part of the Auroraô Collection by Sara Baldwin for New Ravenna. Ettienne Grand, a water-jet stone mosaic, shown in polished Calacatta and honed Nero Marquina, is part of the Auroraô Collection by Sara Baldwin for New Ravenna. Ever Expanding Lotus, a waterjet stone mosaic, shown in honed Ivory Cream, Rosa Portagallo, Jerusalem Gold. Fairfax 1, a waterjet jewel glass mosaic, shown in glass Blue Spinel and Moonstone. Fasaldo, a waterjet and hand-cut stone and Serenity glass mosaic, shown in Aquaberyl glass, honed Cloud Nine, and polished Ming Green. Designed by Paul Schatz for New Ravenna. Fiona, a waterjet stone mosaic, shown in Cararra and polished Thassos, is part of the Silk Road Collection by Sara Baldwin for New Ravenna Mosaics. Fiona, a waterjet jewel glass mosaic, shown in glass Peridot and Quartz. Fiona, a waterjet jewel glass mosaic, shown in Aquamarine jewel glass and Dawn mirror, is part of the Silk Road Collection by Sara Baldwin for New Ravenna. Fishscales, a hand-cut stone mosaic, shown in polished Carrara. Fishscales, a hand-cut stone mosaic, shown in polished Ming Green. Fleet, a hand-cut and waterjet mosaic, shown in Lapis Lazuli, Iolite, Absolute White, and Moonstone jewel glass. Fletcher, a waterjet mosaic, shown in Ironwood ceramic, Gold glass, and Island Fog glass. Fletcher, a waterjet mosaic, shown in Jasper and Alabaster jewel glass. Floating Fish, a waterjet jewel glass mosaic shown in Mica, Sardonyx, Garnet, Pearl, and Quartz, is part of the Erin Adams Collection for New Ravenna Mosaics. Flower Lattice, a hand-cut stone mosaic, shown in polished Verde Luna, Crema Valencia, Calacatta Tia, tumbled Crema Marfil, honed Montevideo, and Jura Gray. Design is all 1 cm. Flower Lattice, a hand-cut stone mosaic, shown in polished Verde Luna, Crema Valencia, Calacatta Tia, tumbled Crema Marfil, honed Montevideo, and Jura Gray. Design is 1 cm and background is 1.5 cm. Flowers, a waterjet jewel glass, mosaic, shown in Opal, Moonstone, Agate and Amber, is part of the Erin Adams Collection for New Ravenna Mosaics. Folia, a hand-cut mosaic, shown in Quartz and Aquamarine Sea Glassô, is part of the Sea Glassô Collection by Sara Baldwin for New Ravenna. Foliole, a hand-chopped stone mosaic, shown in tumbled Renaissance Bronze, and Crema Marfil. Forks Knives and Spoons, a waterjet jewel glass mosaic, shown in Moonstone, is part of the Erin Adams Collection for New Ravenna. Francois, a waterjet stone mosaic, shown in water jet cut polished Saint Laurent, Calacatta Tia and Topaz Onyx, is part of the Illusionsô Collection by Sara Baldwin Designs for New Ravenna. Francois, a waterjet stone mosaic, shown in honed Whitewood, polished Driftwood and Shell, is part of the Illusionsô Collection by Sara Baldwin Designs for New Ravenna. Francois, a waterjet stone mosaic, shown in honed Chinese Black, honed Allure and polished Dolomite, is part of the Illusionsô Collection by Sara Baldwin Designs for New Ravenna. Francois Grand, a waterjet stone and Serenity glass mosaic, shown in matte Raw Fiber, honed Allure and honed Calacatta Tia, is part of the Illusionsô Collection by Sara Baldwin Designs for New Ravenna. Fraser, a waterjet stone and Serenity glass mosaic, shown in Calacatta Venetian honed and Raw Fiber glass flowers with honed Raw Fiber glass bricks. Palm Frond, a hand-chopped stone mosaic, shown in tumbled Chartreuse, and Verde Alpi, is part of the Metamorphosis Collection by Sara Baldwin for New Ravenna Mosaics. Frond Pheasant, a hand-chopped stone mosaic, shown in tumbled Renaissance Bronze, Emperador Dark, Bardiglio, and Jerusalem Gold, is part of the Metamorphosis Collection by Sara Baldwin for New Ravenna Mosaics. Gabriel , a hand-cut stone mosaic, shown in polished Calacatta, Driftwood, and honed Jura Beige and Gascogne Blue. Galileo, a hand-cut stone mosaic, shown in polished Thassos, Botticino, Blue Macauba, Celeste. Ganesha, a waterjet stone, mosaic shown in Calacatta Tia and Bardiglio with a venetian finish, is part of the Silk Road Collection by Sara Baldwin for New Ravenna Mosaics. Ganesha, a waterjet stone mosaic, shown in polished Calacatta Tia, is part of the Silk Road Collection by Sara Baldwin for New Ravenna Mosaics. Garden Party, a hand-cut mosaic, shown in Alabaster, Quartz, and Agate Sea Glassô, is part of the Sea Glassô Collection by Sara Baldwin for New Ravenna. Gran Via, a waterjet stone mosaic, shown in polished Cloud Nine, is part of the Miraflores Collection by Paul Schatz for New Ravenna. Granada Grande, a waterjet stone mosaic, shown in polished Emperador Dark, Verde Luna, Rosa Verona, Calacatta Tia, and Giallo Reale, is part of the Miraflores Collection by Paul Schatz for New Ravenna. Granada, a waterjet stone mosaic, shown in honed Heavenly Cream and polished Ming Green, Cloud Nine, Carrara and Thassos, is part of the Miraflores Collection by Paul Schatz for New Ravenna. Half Shell, a hand-cut stone mosaic, shown in tumbled Thassos and Crema Valencia. Hamish, a hand-cut jewel glass mosaic, shown in Lavastone, Pearl, Moonstone and Marcasite, is part of the Plaids and Ginghams Collection by New Ravenna Mosaics. Hare Apparent, a waterjet glass mosaic, shown in Labradorite honed and Alabaster jewel glass, is part of the Kiddo Collection by Cean Irminger for New Ravenna. Harris 2, a hand-cut stone mosaic, shown in polished Calacatta and Nero Marquina. Hearts, a waterjet jewel glass mosaic, shown in Garnet and George, is part of the Erin Adams Collection for New Ravenna Mosaics. Hearts, a waterjet stone mosaic, shown in polished Calacatta Tia and Thassos, is part of the Erin Adams Collection for New Ravenna Mosaics. Heathrow Grande, a hand-cut and waterjet mosaic, shown in honed Cloud Nine and tumbled Ming Green, is part of the Miraflores Collection by Paul Schatz for New Ravenna. Hercule, a waterjet stone mosaic, shown in honed Cloud Nine, Thassos and Ming Green, was designed by Sara Baldwin for New Ravenna. Honeycomb, a hand-cut stone mosaic, shown in honed Statuary Carrara, polished Lettece Ming, and polished Bardiglio. Uses Studio Line Hexes only. Houndstooth, a waterjet stone mosaic, shown in polished Calacatta and Bayard. Houndstooth, a hand-cut jewel glass mosaic, backsplash shown in Jasper and Alabaster jewel glass, is part of the Houndstooth Collection by Sara Baldwin for New Ravenna. Huelva, a waterjet stone mosaic, shown in honed Heavenly Cream, polished Cloud Nine and Thassos, is part of the Miraflores Collection by Paul Schatz for New Ravenna. Ikat, a hand-cut stone mosaic, shown in polished in Nero Marquina, Saint Laurent, Crema Marfil, and Renaissance Bronze. Ikebana, a hand-chopped stone mosaic, shown in tumbled Nero Marquina and Ming Green. Designed by James Duncan for New Ravenna Mosaics. Ikebana a hand-cut stone mosaic, shown in honed Lagos Gold, polished Verde Luna, polished Travertine Noce, and polished Topaz Onyx. Designed by James Duncan for New Ravenna Mosaics. Indus, a waterjet and hand-cut mosaic, shown in tumbled Nero Marquina, honed Thassos, and Bronze brushed. Designed by James Duncan for New Ravenna Mosaics. Jacqueline, a waterjet jewel glass mosaic, shown in Emerald, Alexandrite, Citrine and Peridot, is part of the Silk Road Collection by Sara Baldwin for New Ravenna Mosaics. Jacqueline, a waterjet jewel glass mosaic, shown in Absolute white, Chalcedony, Peridot, and Quartz/Agate, is part of the Silk Road Collection by Sara Baldwin for New Ravenna Mosaics. Jacqueline, a waterjet stone mosaic, shown in tumbled Thassos, is part of the Silk Road Collection by Sara Baldwin for New Ravenna. Jacqueline Vine, a waterjet jewel glass mosaic, shown in Amethyst, is part of the Silk Road Collection by Sara Baldwin for New Ravenna Mosaics. Jacqueline Vine with Cosmos, a hand-cut and waterjet stone mosaic, shown in polished Lettuce Ming and honed Bardiglio, is part of the Silk Road Collection by Sara Baldwin for New Ravenna. Jacqueline Vine, a waterjet stone mosaic, shown in tumbled Thassos, is part of the Silk Road Collection by Sara Baldwin for New Ravenna Mosaics. Jacqueline, a waterjet stone mosaic, shown in tumbled Bianco Antico, Bardiglio, and Carrara. Jaen Grande, a waterjet stone mosaic, shown in polished Verde Luna, Rosa Verona and Giallo Reale, is part of the Miraflores Collection by Paul Schatz for New Ravenna. Jaen, a waterjet stone mosaic, shown in honed Thassos, polished Celeste, polished Carrara, and polished Collection by Paul Schatz for New Ravenna. Janus Petite, a waterjet jewel glass mosaic, shown in Aquamarine and Quartz jewel glass, is part of the Illusionsô Collection by Sara Baldwin Designs for New Ravenna. Janus, a waterjet mosaic, shown in polished Calacatta Tia and Saint Laurent, is part of the Illusionsô Collection by Sara Baldwin Designs for New Ravenna. Jordan, a hand-cut stone mosaic, shown in tumbled Breccia Oniciata, Calacatta Tia, and Blue Macauba. Kasbah, a waterjet jewel glass mosaic, shown in Mica, Peridot, and Peacock Topaz. Kasbah, a waterjet stone mosaic, shown in Ming Green, Celeste, and Thassos. Kasbah, a hand-cut stone mosaic, shown in Driftwood, Calacatta Tia, and Thassos. Katie, a waterjet stone mosaic, shown in honed Nero Marquina and polished Calacatta Tia. Kelp Forest, a waterjet jewel glass mosaic, shown in Alabaster, is part of the Shades of Gray Collection designed by Sara Baldwin for New Ravenna. Kente, a hand-cut glass mosaic, shown in Agate, Opal, Moonstone and Chalcedony, is part of the Erin Adams Collection for New Ravenna Mosaics. Kingston Lacy, a hand-cut stone mosaic, shown in polished Calacatta and honed Montevideo,is a design by Rogers & Goffigon, reimagined in mosaic. Kuba, a hand-chopped stone mosaic, shown in tumbled Emperador Dark, Rosa Portagallo. Lancaster Large, a hand-cut stone mosaic, shown in polished Calacatta Tia and Nero Marquina, is part of the Palazzo collection by New Ravenna. Lancaster Medium, a hand-cut stone mosaic, shown in honed Afyon White and Horizon, is part of the Palazzo collection by New Ravenna. Leone Grand, a waterjet stone and glass mosaic, shown in Gold Glass, honed Calacatta, and polished Saint Laurent. Leopard, a hand-cut jewel glass mosaic, is shown in Chalcedony, Aquamarine, Quartz, Agate, Obsidian, is a design by Lotty Bunbury for New Ravenna Mosaics. Leticia large, a hand-cut jewel glass mosaic, shown in Mica and Pearl. Leticia, a hand-cut jewel glass mosaic, shown in Quartz and Aquamarine. Loom, a hand-cut jewel glass mosaic, shown in Quartz, Aquamarine, Tanzanite and Turquoise, is part of the Ikat Collection by Sara Baldwin for New Ravenna Mosaics. As seen in Coastal Living. Louis, a stone waterjet and hand-cut mosaic, shown in Gold Glass and honed Thassos, is part of the Auroraô Collection by Sara Baldwin for New Ravenna. Luc, a hand-cut mosaic shown in Afyon White and 24K Gold Glass, is part of the Auroraô Collection by Sara Baldwin for New Ravenna. Lucius, a hand-cut stone mosaic, shown in polished Calacatta Tia and honed Thassos, is part of the Palazzo collection by New Ravenna. Magdalena, a hand-cut stone mosaic, shown in polished Shell, Thassos, Dolomite and Afyon White, is part of the Auroraô Collection by Sara Baldwin for New Ravenna. Maharaja 1, a hand-cut and waterjet stone mosaic, shown in polished Nero Marquina and honed Calacatta Tia, is part of the Silk Road Collection by Sara Baldwin for New Ravenna Mosaics. Maharaja 1, a hand-cut and waterjet stone mosaic, shown in polished Driftwood and honed Calacatta Tia, is part of the Silk Road Collection by Sara Baldwin for New Ravenna Mosaics. Maharaja 2, a hand-cut and waterjet stone mosaic, shown in Thassos and honed Calacatta Tia, is part of the Silk Road Collection by Sara Baldwin for New Ravenna Mosaics. Marabel, a hand-cut stone mosaic, is shown in honed Thassos and polished Afyon White marble. Marabel, a hand-cut jewel glass mosaic shown, in Aquamarine and Quartz jewel glass, is part of the Silk Road Collection by Sara Baldwin for New Ravenna. Margot, a waterjet jewel glass mosaic, shown in Gold Glass and Tiger’s Eye. Marshall, a waterjet stone mosaic, shown in honed Horizon, is part of the Parquet Line by Sara Baldwin for New Ravenna Mosaics. Maxwell, a waterjet stone and Serenity glass mosaic, shown in Venetian honed Bardiglio and Tropical White glass. Designed by Sara Baldwin Designs for New Ravenna. McIntyre, a hand-cut stone mosaic, shown in honed Thassos, Bardiglio, and Nero Marquina , is part of the Plaids and Ginghams Collection by New Ravenna Mosaics. Meadow, a hand-cut stone mosaic, shown in tumbled Kay’s Green, Wujan Jade, and Chartreuse, and polished Emperador Dark, Joanna, Blush, Rosa Noreiga, Thassos and Rosa Portogallo, is part of the Metamorphosis Collection by Sara Baldwin for New Ravenna Mosaics. Medina, waterjet jewel glass mosaic, shown in Aquamarine, Shell, Agate, is part of the Miraflores Collection by Paul Schatz for New Ravenna Mosaics. Medina, a waterjet stone mosaic, shown in polished Ming Green and Carrara and honed Thassos, is part of the Miraflores Collection by Paul Schatz for New Ravenna. Milky Way, a hand-cut stone mosaic, shown in honed Ivory Cream, polished Renaissance Bronze, Celeste, and Blue Macauba. Mirage,a hand-cut stone mosaic, shown in tumbled Kay’s Green, Celeste, Thassos, Blue Macauba, Blue Bahia, Ming Green. Mireille, a waterjet stone mosaic, shown in honed 24K Gold Glass, Lagos Gold and Sylvia Gold, is part of the Auroraô Collection by Sara Baldwin for New Ravenna. Mireille, a waterjet stone mosaic, shown in honed 24K Gold Glass, Calacatta and Saint Laurent, is part of the Auroraô Collection by Sara Baldwin for New Ravenna. Mireille, a waterjet stone mosaic, shown in honed 24K Gold Glass, Calacatta and Dolomite, is part of the Auroraô Collection by Sara Baldwin for New Ravenna. Mist, a hand-cut stone mosaic, shown in 1.5 cm polished Renaissance Bronze, Calacatta, and Crema Marfil. Mist, a hand-cut stone mosaic, shown in 1.5 cm polished Thassos, Calacatta, Carrara, Bardiglio, and Allure. Mist, a hand-chopped stone mosaic, shown in 1.5 cm tumbled Calacata Tia, Celeste, Kay’s Green, Blue Macauba. Mist, a hand-chopped stone mosaic, shown in 1.0 cm tumbled Blue Macauba, Kay’s Green, and Ming Green, Celeste. Mist Glass Stalks, a hand-cut jewel glass mosaic, shown in Agate, Aquamarine, Turquoise, and Peacock Topaz. Mist Glass Stalks, a hand-cut jewel glass mosaic, shown in Carnelian, Tiger’s Eye, Agate, and Quartz. Mist Tatami, a hand-cut stone mosaic, shown in Tumbled Blue Macauba, Kay’s Green, Ming Green, and Celeste. Mod Drops 2, a waterjet stone mosaic, shown in polished Nero and Thassos, is part of the Erin Adams Collection for New Ravenna Mosaics. Mod Drops, a waterjet stone mosaic, shown in polished Lettuce Ming and Chinese Black, is part of the Erin Adams Collection for New Ravenna Mosaics. Monogram, a hand-cut stone mosaic, shown in polished Nero Marquina and Blue Macauba. Moonriver, a hand-cut stone mosaic, shown in polished Carrara, Nero Marquina, and Kay’s Green. Moonriver, a hand-cut stone mosaic, shown in honed Saint Richard, Fontenay Claire, and Gascogne Blue. Moonshadow, a hand-cut stone mosaic, shown in tumbled Calacatta Tia, Crema Marfil, and Renaissance Bronze. Muna, a waterjet and hand-cut stone mosaic, shown in honed Thassos and polished Calacatta Tia. Muna, a waterjet and hand-cut stone mosaic, shown in polished Honey Onyx and Calacatta Tia. Muses, a waterjet and hand-cut stone mosaic, shown in Thassos and Carrara. Nami, a hand-cut stone mosaic, shown in polished Botticino and polished Jura Grey. Napoleon and Bonaparte, a waterjet stone mosaic, shown in polished Calacatta, Thassos, and Gold Glass. 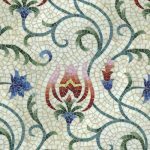 Natasha, a hand-cut jewel glass mosaic is shown in Iolite, Lapis Lazuli, Blue Spinel, Covelite, and Feldspar, is part of the Delft Collection by Sara Baldwin for New Ravenna Mosaics. Navarra, a waterjet stone mosaic, shown in Fireclay Spanish Moss, honed Lavigne, and polished Calacatta Tia, is part of the Miraflores Collection by Paul Schatz for New Ravenna. Nile, a waterjet jewel glass mosaic, shown in glass Jasper and Lavastone. Oasis, a waterjet jewel glass mosaic, shown in Peacock Topaz and Aquamarine. Oasis, a waterjet stone mosaic, shown in honed Thassos and polished Calacatta. Octopus’s Garden, a waterjet jewel glass mosaic, is shown in Moonstone. Ombre Chevron, a hand-cut jewel glass mosaic shown in Lavastone, Zircon and Alabaster is part of the Shades of Gray Collection by Sara Baldwin for New Ravenna. Orson, a hand-cut stone mosaic, shown in Shell, honed Thassos, Gold Glass, and polished Calacatta Pennyrounds. Paisley, a hand-cut stone mosaic, shown in polished Blue Macauba, Travertine Noce, Crema Marfil, and Renaissance Bronze. Paisley Vine, a hand-cut jewel glass mosaic, is shown in Peridot, Quartz, Turquoise, Peacock Topaz, Tiger’s Eye, Chalcedony, Garnet, Citrine, Aventurine, Tanzanite and Amber. Palm, a hand-cut stone mosaic, shown in polished Thassos and Chartreuse. Pamir, a hand-cut jewel glass mosaic, shown in Carnelian and Tortoise Shell, is part of the Ikat Collection by Sara Baldwin for New Ravenna Mosaics. Pamir, a hand-cut jewel glass mosaic, shown in Quartz and Mirror is part of the Ikat Collection by Sara Baldwin for New Ravenna Mosaics. Pandora, a waterjet jewel glass mosaic, is shown in Tourmaline and Lavastone. Pandora, a waterjet jewel glass mosaic, is shown in Covellite and Moonstone. Path. a hand-cut stone mosaic, shown in honed Thassos and polished Calacatta Tia. Peacock, a hand-cut jewel glass mosaic, is shown in Obsidian, Jasper, Tortoise Shell, Peacock Topaz, Peridot, Carnelian, Tiger’s Eye, Aventurine, Malachite and Opal. Pembroke, a waterjet stone mosaic, shown in Calacatta Tia, Thassos and Nero Marquina honed, is part of the Silk Road Collection by Sara Baldwin for New Ravenna Mosaics. Penna, a hand-chopped stone mosaic, shown in tumbled Verde Luna, Jura Grey, Botticino, and Montevideo. Peony, a hand-cut jewel glass mosaic, shown in Peridot, Moonstone, and Aventurine. Perrault, a hand-cut jewel glass mosaic, shown in Quartz, Covellite, Iolite, and Lapis Lazuli. Plaza, a hand-cut stone mosaic, shown in tumbled Verde Luna and polished Verde Alpi, Calacatta Tia, Giallo Reale, and Jerusalem Gold. Pleiades, a hand-cut stone mosaic, shown in tumbled Renaissance Bronze, Honey Onyz, and Ivory Cream. Plum Blossom, a hand-cut stone mosaic, is shown in polished Calacatta Tia, Desert Pink, Saint Laurent and Lavender Mist. Poco Via, waterjet jewel glass mosaic, shown in Chalcedony, is part of the Miraflores Collection by Paul Schatz for New Ravenna Mosaics. Quilt, a waterjet stone mosaic, shown in polished Blue Macauba, polished Kay’s Green, honed Montevideo. Quilt, a waterjet stone mosaic, shown in polished Carrara, Lettece Ming, and Bardiglio. Radiance, a hand-cut stone mosaic, shown in polished Bardiglio, honed Horizon, honed Cashmere, polished Carrara, and polished Calacatta Tia.-not available in glass Installed in the 2012 Hampton Designer Showhouse, Water Mill, NY presented by Traditional Home. Reina, a waterjet and hand-cut stone mosaic, shown in Ming Green and Thassos polished, is part of the Miraflores Collection by Paul Schatz for New Ravenna Mosaics. As seen in Elle Decor. Reve, a jewel glass mosaic, shown in 24K Gold Glass and Agate and Quartz Jewel Glass, is part of the Auroraô Collection by Sara Baldwin for New Ravenna. Rivulet, a hand-cut stone mosaic shown, in Heavenly Cream and Jerusalem Gold, is part of the Metamorphosis Collection by Sara Baldwin for New Ravenna Mosaics. Rory, a hand-cut jewel glass mosaic, shown in Tanzanite, Turquoise, and Amazonite. Ruche, a waterjet stone mosaic, shown in polished Calacatta, polished Thassos, and Cream Onyx. Saturn, a hand-cut stone mosaic, shown in polished Rosa Portagallo, Celeste, and Thassos. Sea Stars, a hand-cut stone mosaic, shown in honed Saint Ricahrd, polished Thassos, and polished Celeste. Sebastian large, a waterjet stone and Serenity glass mosaic, shown in honed Carrara, Shell, and Island Fog glass. Sebastian small, a waterjet stone mosaic, shown in polished Cloud Nine, Dolomite, Ming Green, and Shell. Seine, a waterjet stone mosaic, shown in polished Thassos and Calacatta Tia, is part of the Silk Road Collection by Sara Baldwin for New Ravenna Mosaics. Seine, a waterjet stone mosaic, shown in polished Nero Marquina and Calacatta Tia, is part of the Silk Road Collection by Sara Baldwin for New Ravenna. Serena, a hand-cut jewel glass mosaic, shown in Aquamarine and Quartz. Simone By James Duncan, a waterjet and hand-cut stone mosaic, shown in polished Thassos and tumbled Blue Macauba. Sinuous Field, a hand-cut stone mosaic, shown in 1.5 cm polished Celeste. Sinuous Field, a hand-cut stone mosaic, shown in 2.0 cm polished Cloud Nine. Smalti, a hand-cut jewel glass mosaic shown in Agate, Pearl, Quartz, and Opal, is part of the Erin Adams Collection for New Ravenna Mosaics. Soleil, a hand-cut stone mosaic shown in 24K Gold Glass and honed Saint Laurent, is part of the Auroraô Collection by Sara Baldwin for New Ravenna. Solid Ovals, a waterjet and hand-cut stone mosaic, shown in Calacata Tia and polished Nero Marquina, is part of the Silk Road Collection by Sara Baldwin for New Ravenna Mosaics. Sophie, a waterjet stone mosaic, shown in polished Calacatta Tia and honed Thassos, is part of the Silk Road Collection by Sara Baldwin for New Ravenna. Sophie, a waterjet stone mosaic, shown in Shell and honed Saint Laurent, is part of the Auroraô Collection by Sara Baldwin for New Ravenna. Strap large, a waterjet and hand-cut stone mosaic, shown in honed Calacatta Tia, Emperador Dark, and Jerusalem Gold. Strap small, a waterjet stone mosaic, shown in honed Nero Marquina, Thassos, and Bardiglio. Surge a hand-cut stone mosaic, shown in 1.5 cm polished Calcatta. Suzani, a hand-cut jewel glass mosaic, shown in Carnelian, Obsidian, Quartz, and Agate. Tamsin, a hand-cut stone mosaic, shown in polished Calacatta Tia, Verde Luna, Verde Alpi, Giallo Reale, Renaissance Bronze, Rosa Verona, Spring Green, Blue Macauba and Blue Bahia. As seen in Veranda. Tatami Mat, a hand-cut stone mosaic, shown in polished Breccia Oniciata, Travertine Noce, and Travertine White. Tigress Siberia, a hand-cut stone mosaic, shown in tumbled Calacatta Tia, Jura Grey, and Celeste. Tivoli, a hand-cut stone mosaic, shown in honed Lagos Gold, Botticino, and Ivory Cream. Twiggy, a hand-chopped stone mosaic, shown in tumbled Crema Marfil and Nero Marquina. Designed by James Duncan for New Ravenna. Vela, a hand-chopped stone mosaic, shown in Travertine Noce and Jerusalem Gold. Designed by James Duncan for New Ravenna. Venus, a waterjet and hand-cut stone mosaic, shown in polished Crema Marfil, polished Thassos, honed Montevideo. Vincent , a waterjet stone mosaic, shown in honed Thassos and Calacatta Tia. Waves, a waterjet jewel glass mosaic, shown in Jade. Beige Waves, a waterjet stone mosaic, shown in polished Crema Marfil, honed Jura Grey, polished Calacata Tia. Willow, a hand-cut stone mosaic, shown in polished Celeste, Verde Luna, Travertine Noce, Topax Onyx, Chartreuse. Zazen Grande, a waterjet stone mosaic, shown in Venetian honed Bianco Antico, is part of the Miraflores Collection by Paul Schatz. Zazen Grande, a waterjet stone mosaic, shown in Venetian honed Cavern, is part of the Miraflores Collection by Paul Schatz. Zazen, a waterjet stone mosaic, shown in polished Calacatta Tia and honed Gascogne Blue, is part of the Miraflores Collection by Paul Schatz for New Ravenna. Zebrano, a hand-cut stone mosaic, shown in polished Travertine Noce, Emperador Dark, Emperador Light, and Saint Laurent.